Bird cages are homes for domesticated birds. Birds require a house in which they can fly and have some freedom but still ensures they do not fly away. Bird cages are constructed to be large enough to accommodate the motion and daily activities of domesticated birds. Cages are generally constructed of wire mesh. Some manufacturers flatten the mesh and others leave the wire round just as it is obtained from the manufacturer. Cages must be constructed with mesh carefully welded in a grid that will not permit a bird to put his or her head through the mesh and strangle. The mesh is generally 1.5 × I in (3.8 × 2.5 cm) in grid. Even larger birds such as parrots are rarely put into cages with mesh larger than 1 × 1 in (2.5 × 2.5 cm). The design of bird cages is varied. Some cages hold one or two small domesticated birds and are rectangular or square. Polygonal cages are popular and can be quite decorative. Some cages have a plastic or metal tray that fits underneath a mesh cage without a bottom so that cleaning the cage only entails detaching the tray. Others have seed catching trays that are far wider than the cage so that the tray catches all stray seeds dropped by the bird. Still other cages are made specifically to breed birds and are of a very different configuration. These bird-breeding cages are quite wide with a divider in the middle that is removed when the birds in each half of the cage have gotten used to the presence of the other. Then breeding begins. Bird-breeding cages are often made to the specifications of breeders and are designed after observation and feedback from the breeders. The history of the bird cage is tied to the adoption of birds as pets. Birds were caged for their beauty and mystery nearly four centuries ago in ancient Egypt. Doves and parrots were favorites of the Egyptians and are depicted in hieroglyphics. The Mynah has been considered a sacred bird in India for at least 2,000 years as well. The birds were pulled through the streets on oxen, likely in crude cages to ensure they would not escape. It is difficult to determine what some of these cages may have been made of, perhaps wooden twigs, rope mesh, reeds, or bamboo. Some say that Alexander the Great was given a parakeet by one of his generals and the Alexandrine parakeet was named in his honor. Ancient Romans kept and held birds as well and it was considered the duty of a slave to care for the domesticated animal. By the Middle Ages only the wealthy kept caged birds. When Western traders brought back spices and textiles from the Far East, they also brought the exotic birds as pets. Birds were much beloved pets in the American Colonies. Bamboo and wooden cages were seen in many kitchens in the New World, generally hung near open windows. By the Victorian era the bird was considered even more than a pet. The decorative cage was seen as an important ornamentation within the Victorian parlor. Wire cages were far more effective and long-lasting cages than more ephemeral cane, bamboo, or wood, and wire mesh cages are much preferred in the twentieth century. The essential components of the bird cage are very simple. Most American-made cages are made from wire mesh. These rolls generally come in varying widths and are keyed to the widths of the panels to be cut from them. These rolls may be between 100-200 ft (30-61 m) in length and are very heavy. Bird cage makers do not manufacture the mesh; instead, they purchase it from wire mesh or fencing manufacturers. A quality bird cage must be made from precisely configured mesh or the cage will not be stable or safe for the bird. As the panels and sides are cut directly from the mesh, it must be evenly spaced or the cut panels will not meet precisely at the edges. American manufacturers seek suppliers who can deliver tolerance welded wire meaning that the mesh is produced within minute tolerances, generally assumed to vary less than 0.13 in (3.2 mm) within a 10 ft (305 cm) length. The width of the mesh varies greatly depending on which species of bird the cage is designed to accommodate. Larger birds can have a slightly larger mesh, but manufacturers are careful to keep the mesh fairly tight. Additionally, most American bird cages are made from galvanized steel as this is a material that sturdy and inexpensive, thus keeping the cost of the cage reasonable. Some bird breeders prefer a stainless steel cage. However, stainless steel mesh is nearly five times the cost of galvanized steel mesh and stainless steel cages can cost in excess of two hundred dollars. The components of the standard American-made rectangular birdcage includes four sides of a rectangular cage, a door, a top, and a plastic or metal tray that serves as a bottom for the cage. Huge rolls of wire mesh of varying widths enter the factory as different widths are used for different parts of the cage. The large rolls, up to 200 ft (61 m) in length, are constructed of true metal wire with rounded edges. Some companies prefer to offer bird cages that do not have round wire but have flattened mesh. In this cage, the mesh rolls are automatically fed into a machine called a cold roller press that flattens the wire mesh without using heat, only pressure. Various widths of rolls are flattened in this fashion; smaller widths used for doors or specialized parts of the cage are thus all flattened using the press. Next, the panels which have been cut out of the wire mesh must be physically separated from the wire mesh. The mesh, with panels still intact, is fed automatically into another machine, and the machine uses a hydraulic punch to remove the panel from the mesh. This happens with all the components of the cage cut out of mesh. The door panels of the cage must be reinforced with another brace or wire around them. Thus, the door panels are automatically soldered with another band of wire along the outside of the door. This strong wire addition leaves no rough edges of cut gauge, strengthens the door in order to provide a secure door for the bird, and provides a stable, consistent edge by which the door can be hinged to the cage body. The components are now all cut. The door must be connected to the front panel. The door, a bit larger than the opening in the front panel, is attached to the panels with ferrules. An air gun is put up to the door and the side panel, and an open clip encircles the door panel and the front panel. At least two ferrules are attached to the door and the front panel and thus serve as hinges. Most bird owners prefer that their pets do not sit in cages with a mesh bottom as it is uncomfortable for the bird to constantly perch on wire. Furthermore, a fully enclosed cage is very difficult to clean. Instead, most bird owners prefer cages with open bottoms into which they fit a metal or plastic tray that can be pulled out for cleaning. A plastic tray is made from plastic pellets fed into a hopper and melted. The liquid is then injected into a mold and cooled. The finished tray is then ejected. A steel tray is made from thin metal sheets placed in a die. A hydraulic punch is released and forces the metal into the shape of the die. Many American bird cages are shipped flattened as shipping costs are too great to ship them fully constructed. Instead, simple metal clips are enclosed in plastic packaging in order for the retailer or the consumer to assemble and secure the cage at point-of-sale or in the home. Thus, the bird cage is now complete and ready for packaging into cartons. Quality control is very important in the manufacture of bird cages. Every operator on the manufacturing line looks carefully for sharp edges or stubs in the panels that may hurt the bird. If burrs are found in any of the panels these must be ground down using a machine sander. 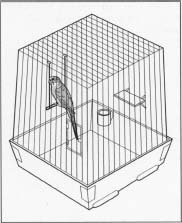 Additionally, the cage must be secure so that the bird does not slip out of any gaps in the cage should the panels not line up evenly. Poor registration of the sides and/or top is primarily the result of poorly-configured mesh wire. It is imperative that the raw material used in the construction of the bird cage be very carefully inspected upon receipt. Most manufacturers only use materials that are certified meaning they are guaranteed to be made to specifications. Some manufacturers are very careful not to purchase mesh that is full of drips resulting from the galvanizing process. These drips are heavy in zinc, used in the plating process. Some bird breeders and veterinarians believe that excessive zinc can lead to zinc toxosis in which the bird is poisoned by an overabundance of zinc ingested through nipping at the zinc galvanizing from the mesh cage. Excessive globs are generally removed from the mesh for this reason if they are found upon inspection. A batch of wire may be rejected if too many such drips are found upon inspection. There is a fair amount of waste that results from punching out the mesh panels of the sides, top, and particularly the doors. This metal waste is gathered up after the panels are punched out, dropped into a dumpster and recycled into new wire. The future for American bird cage manufacturers is a bit cloudy at present. Many bird cages offered in pet stores and large discount houses are made out of the country where labor costs are about one-tenth of labor costs in the United States. The result is that the foreign product is often far cheaper than the American product. Many manufacturers and consumers agree that the imported products are far less sturdy and may not pay attention to issues such as excessive galvanization which may be harmful to birds. American manufacturers have dwindled in the last several years and many are wary with their ability to compete with cheap imports. Garrett, Elisabeth Donaghy. At Home: The American Family Home 1750-1870. New York: Harry N. Abrams, 1998. "Bird." Encyclopedia Britannica CD Edition. Encyclopedia Britannica, Inc., 1994-1998. Dale, Steve. "The History of Birds as Pets." The Pet Project Web Page. December 2001. < http://ecol.webpoint.com/pets/birdhist.htm >. Oral interview with Willis Kurtz, President of Safeguard. New Holland, PA. October 2001. Oral interview with Guy Cone, President of Quality Cage Company. Portland, OR. October 2001.